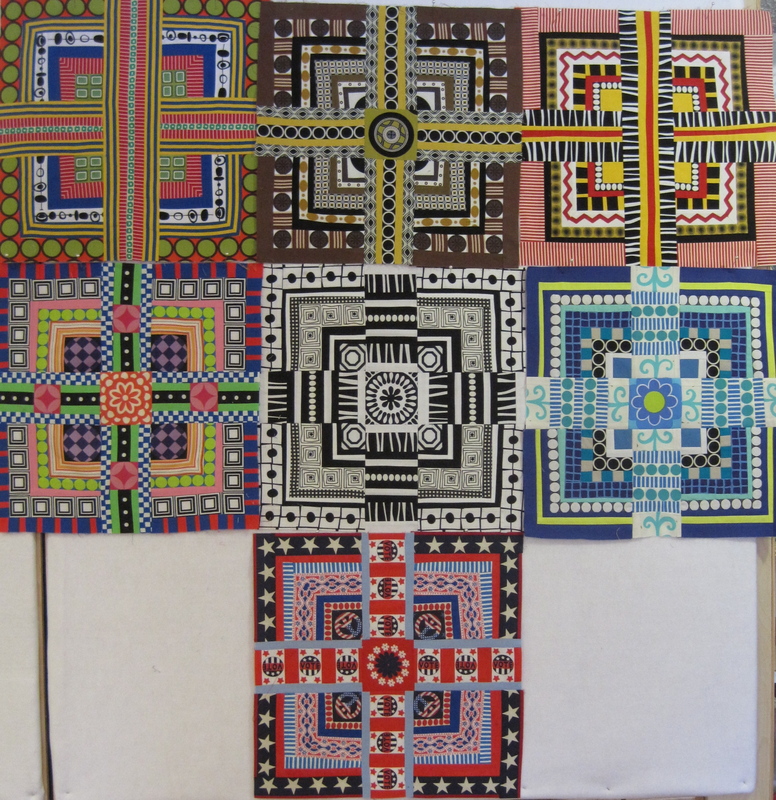 The Studio Art Quilt Associates (SAQA) big annual fundraiser is the SAQA Benefit Auction. Members are encouraged to donate a small 12” x 12” quilt to be auctioned off in a reverse auction. The price for each piece on the first day is $750. Over the course of a week, the prices drop steadily until the last day when the auction price is $75 a quilt. I have been a big fan of this auction for years and have acquired many beautiful pieces. I spend time looking at the pieces and visiting artist websites. It is a great way to see what other artists are doing. It is also a fun way to win a piece by an artist whose work you love. It is a bit like the NCAA tournament for me. I keep track of whose work went early and what pieces I still afford. My collection is primarily based on works by newer artists. I love selecting a piece by a lesser known artist and then watching that artist’s career grow over time. It makes me feel like I picked a winner. Last year, was the first year I made a piece for the auction. Because I am a piecer, I find it very hard to work small. Then I hit upon the idea of making minis. I wrote about my first minis last month. The short version of that story is that for each Color Grid I make, I also make the following. A Mini- which is a 12” x 12” version of a Color Grid. A Party-which includes 9 sketches. This is what I am working on right now. I’ve got to create two more Solos to finish this party! Then of course the Color Grids. I like doing this. 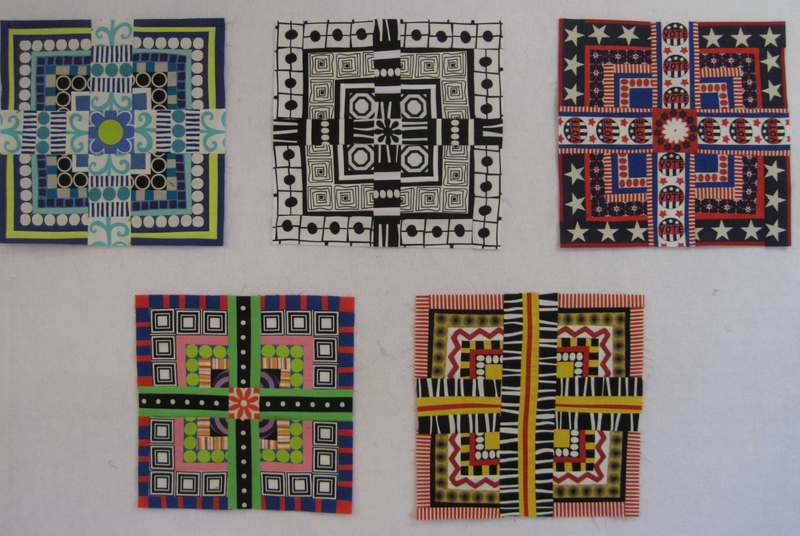 I like repetion and making these quilts in different formats and sizes is appealing to me. This past week, I was working on the “Party” and I decided I might as well make the Minis too. And so I did. Here are all my minis together. This, of course, makes me want to try and make minis for every Color Grid I have made. I now have five minis. Which one should I donate to the SAQA auction? Do you have a favorite? Note- I’m linking this post to Nina-Marie’s Off the Wall Fridays. Check it out to see what other fiber artists have been doing this week. 11 May	This entry was published on May 11, 2013 at 9:19 AM. It’s filed under Quilts Stories and tagged Color Grids. Bookmark the permalink. Follow any comments here with the RSS feed for this post. ohhh I love your contributions! I have so much fun looking at all the donations every year – so much inspiration! Thank you Elizabeth and Nina-Marie. I’m glad you stopped by. I’m a piecer, too, and have hesitated to make such a small piece for the SAQA auction. The minis are a great idea. And they are beautiful! Heather- I would love to see what one of your auction quilts would like like! Fun! I love looking at the subtle variations between each piece in a group. I think Get On Up has to be my favorite. I will be looking for one in the next auction. Thank you Sharon. I’m glad you like Get On Up.